After reading blogs, articles, reviews on quilting lining to fashion fabric, I jumped into the adventure. Why not, my first few tests were conclusive and my walking foot was so much willing to help. Quilting per se is not difficult at all you start with a strait line, you stitch strait, use a waling foot with a guide and you go. My dress is simple, I only had to quilt three pieces. Two for the back and one for the front. 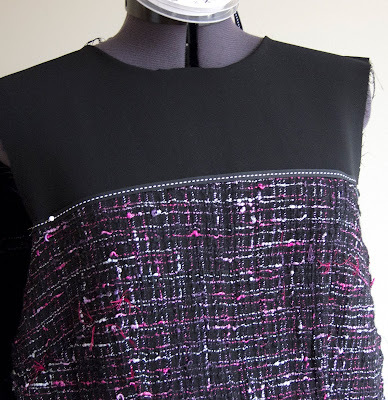 One of the best reference, if you start such a project, is Birgitte's blog: Bubblegum4breakfat. Read all of her projects on the Chanel technique, you will not be deceived. Since I encountered situations for which those references did not have answers, here are my recommendations. Now you are ready to quilt each pieces. 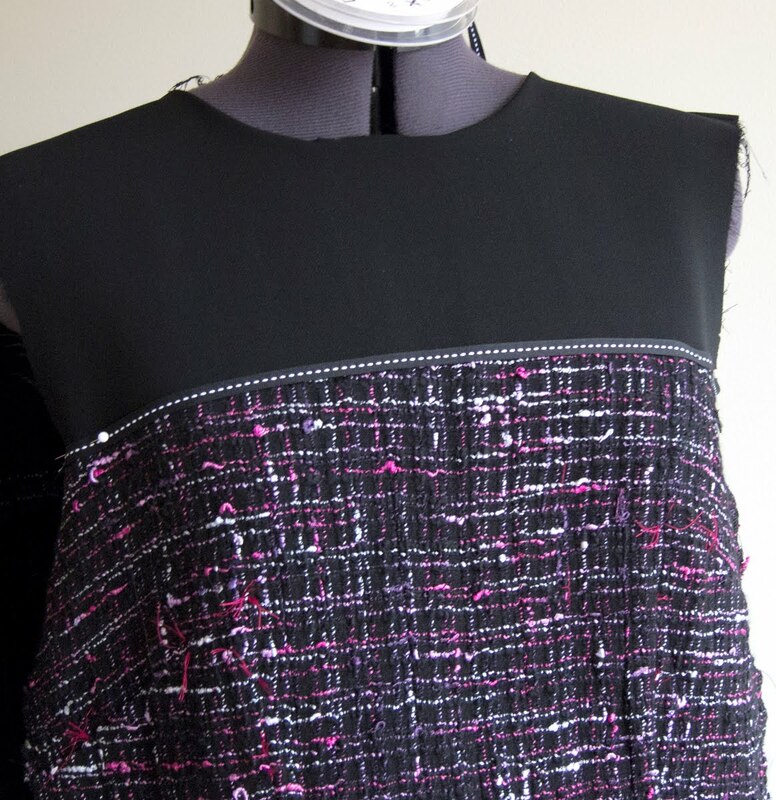 Of course the lining pieces exceed the size of the fashion fabric pieces it is attached to. This does not matter at all. test with scraps of lining and fashion fabric see here. It might sometimes be easier to quilt with fashion fabric on top or underneath. 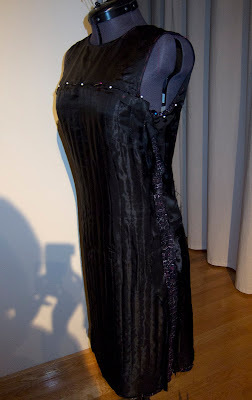 In my case the fashion fabric was so bouclé that it got caught into the walking foot one every second stitch. if your fabric does not have vertical line (like the one I used) draw in strait line in the centre of your pieces (front or back). It will be the first one you quilt. leave at least 3 cm on side and top hedges not quilted. This is necessary for your seams with extra space for last minute alteration. for the hem, if you hem width is of 5 cm stop at least 7 cm above hem line. 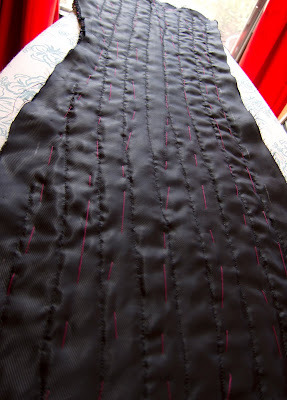 keep very long threads both at the beginning and end of you quilting lines. Those will be knotted only at the end. you can quilt vertically only or make squares as you which. Here are examples of both techniques. Here as well. Choose the one for you. When the quilting is all done, put the tissue pieces over the fashion fabric to verify that the size of piece is appropriate. Mark all seam line with thread. Finish the lining seams by hand. As you can see in the first picture, the dress is all assembled. I simply need to hand stitch the lining seams and attach it to the zipper. I should finish it this weekend. For the outside (I am working so much on the inside that I forget that the dress as a right side ;-)), I am thinking about adding a braid. To trim or not to trim, what do you think? N.B. The picture with the trim was taken in an earlier stage of construction. What a great tutorial and a lot of information on all the intriguing world of wool Chanel, Oh my God! 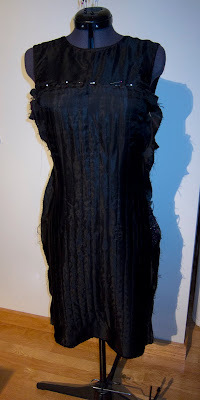 That dress is EXQUISITE !!!!! Thanks for stopping by my blog. The tips on sewing with fine fabrics were really helpful. I love your quilted dress. There's something about quilting the fabric that makes the fabric hang really nicely.